Google announced Project Stadia, its new game streaming service, during the 2019 Game Developer's Conference in San Francisco. According to Sundar Pichai, Google CEO, the idea is to build "a gaming platform for the whole world," eliminating the barriers to access for players for the most sophisticated games available today. Launching a game, according to Pichai, is as simple as clicking on a YouTube link. The new platform is called Stadia (Stadium, in Latin), and aims to be a place where players and spectators can share the experience together. The service is the result of two years of research. The first public demonstration, called Project Stream, released last October allowing playing to stream the game Assassin's Creed Odyssey. Stadia is not a console, it is a service. Users will be able to play on any device with a Chrome browser, from a desktop PC to an Android smartphone, including even the simplest of Chromebooks. Google promises very low latency thanks to its extensive network of data centers around the world, and the ability to "jump" from one device to another instantly, resuming the game exactly where you left it. During tests with Project Stream, Google broadcast Assassin's Creed Odyssey in 1080p at 60 frames per second, with stereo sound. But Stadia goes further: Google promises to be able to broadcast games in 4K with HDR at 60 frames per second, with surround sound. And according to Google, the service is even scalable to broadcast games in 8K in the future. To control the play, users can use any USB or Bluetooth control they already have, but Google has also developed a special control, the Stadia Controller, tailored for the service. The control pad, which connects via Wi-Fi directly to the server where the game is running, features is a button to automatically share your match, in real time, as a Live Stream on YouTube. Another button allows players to call Google Assistant for tips on how to get past difficult parts of a game. In addition, the gamepad has a very common configuration, with four action buttons, four triggers, two analog sticks and one d-pad. We still don't know if there are motion sensors or a vibration system. Judging by the images on stage, the Stadia Controller will be available in black, white and blue. Stadia runs on AMD processor-based servers, with a custom GPU with 10.7 Teraflops of calculation acceleration, more than twice the performance of a PS4 Pro. And that's just the start of the platform. The games may add or remove power during the match according to the processing required at that time in the game. The operating system is Linux, and the platform supports the most popular engines in the gaming industry at the moment, such as Unreal Engine, Unity and the Havok physics system. During the presentation Marty Stratton, executive producer of id Software, went on stage to announce that Doom Eternal will be available for the service, running in 4K with HDR+ at 60 frames per second. Yves Guillemot, the founder of Ubisoft, was also present in the audience, which indicates that the company will also support the service. Cool! How can I play? 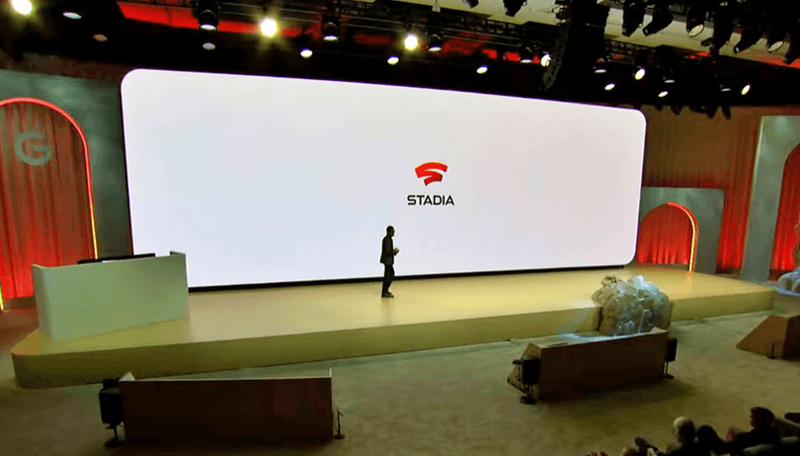 The Stadia will be available to the public later in 2019, initially launching in the USA, Canada, UK and "most of Europe". No information on the price or details about the subscription plans was announced. What do you think of Stadia? Are you going to sign up? Will this service works just with URL? Use that link (URL) to play games or it required any device other than PCs or mobile phones?